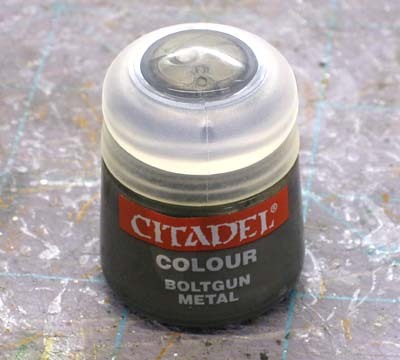 While it may seem hard to believe, I just recently purchased my very first pot of GW Boltgun Metal paint the other day. Like painting my first Ultramarine model, I feel as though I've completed some rite of passage in finally buying this. I use a good amount of metallics in my work. I guess the rest of you do too so it's really not that odd. Since I do very little NMM work, it's the only other option I can think of. And to be honest, I prefer the look of metallic paint over the NMM effect on models. Up until now, I've used an off brand that is very close to this. The only real difference being that the stuff I've been using to date is much more cool than Boltgun Metal which has a very warm look. I do like how this stuff goes on though, nice and smooth. That's one of the first things I noticed over my current brand of paint. The smoothness and consistency. I guess I just figured all metallic paints were like that (problematic) and it was just something I had to deal with. Now I've had a pot of Tin Bitz lying around for a while now, but it's one of those colors I never seem to use. I think I may have used it twice since picking it up. There just never seems to be anything I can paint with it. On the rare occasion I'll find a widget or something small on a model and think to myself, "That would look cool painted up in a bronze like color." But other than that, all it does is collect dust on my shelf. It's not like black that never sits still long enough to collect any dust. Maybe with my new Boltgun Metal, I'll find using metallic colors isn't so problematic. Maybe I'll even start looking for things to paint with my Tin Bitz. Painting your models... love to or hate to? I really like BGM as a paint but I've had a couple of bad pots lately. one was too thin and the other too thick, so it has started to set in the pot. Tin bitz works really well as an aged copper, a bit of dwarf bronze for highlights and wear then a very thinned hawk turquoise as a wash.
Agree with Devlanmud above about the aged copper. Used it recently for a gift diorama - a wrecked mech in the orc ruins. Worked real well for the dark feel of the overall set. Devlanmud: You know, I think my Chardonite Granite has thickened up and become all but unusable recently. I went to use it last night and it seemed like thick PVA glue. I really like BGM too. I'm also a massive fan of Devlan Mud. The colour not the commenter above. I've found most of the foundation paints dry out quick. Maybe its the new pots I dunno. However, I like all the foundations. They cover really well and with a bit of water they're smooth. I've been using Boltgun Metal for several years now and I couldn't imagine painting any army without it. Indeed, it is very smooth and has a great consitency to work with, just as you said. Have you tried the Vallejo Model Air metallics? They are made for airbrush use, but work superbly with a brush. I have not found a smoother finish to date and they give great coverage. No need to thin either. I use their Steel and Silver. I also have their Gold, but its a very very pale gold so I only use it sparingly. For gold, I like Reaper paints. The most realistic metallic out there but a plastic model has to be 100% primed with a Laquer based primer such as Tamiya or it will eat the plastic. Resin and Finecast should be perfectly fine as it does not eat resin. But you can see you face in the shine no joke. Must second the Vallejo Model Air metallics. The are pre-thinned so and formulated to be used with an airbrush. I think that use means the metal flake is smaller and more concentrated. Regardless they cover great and the finish is incredibly smooth. The only problem I am finding is that the non-silver colors tend to be a bit pale. Other than that I love them. I inserted a bearing ball into most of the paint pots I regularly use, but I find that they are most needed in metalics - the metal pigment is insoluble suspension which needs to be thoroughly disturbed to be consistent. GW metallics in general, and Boltgun Metal in particular, are some of my favorites - I also use a lot of Tin Bitz on my Warmachine models, it just seems to fit well with the "steampunk" aesthetic. I just recently started using the Model Air metallics - as others have said: they're great, even with a brush. I also really like Vallejo's Model Color brass. I sometimes use Tin Blitz as an undercoat to Bolgun Metal , it can have a nice effect when washed with a brown or black. I adore Games Workshop's paints, always have. Now, I haven't tried Vallejo paints, but I prefer GW over formula P3. I find I work best with the GW brand. GW metals can be a little finicky at times, but I still use them exclusively. While we're talking about trying new paints- Ron, have you tried any P3 paints? You should really try a few. Their blues and reds in particular are fantastic. And Menoth White Highlight is possibly one of the best paints I've used. So fantastic for mixing highlights! Also, blending from Meridius Blue through Arcane Blue up to MWH is a super easy and effective power weapon or magical glowing effect. It almost feels like cheating! Interesting (and timely) article, Ron - I've been slowly replacing my GW paints with the Vallejo Game Color line, but I've found that I really much prefer the GW metallics, especially Bolt Gun Metal. The VGC equivalent that I picked up had rather poor coverage and had a distinctly bluish tint that I didn't much care for. Suffice it to say I've tossed it and gone back to the GW pots for my metallic needs! FromTheFang: But once you learn to go past using Devlan Mud, you'll really like the range of washes. Stempe: Nice work there. To be honest though, I wouldn't have known that was BGM. I just figure it's what people use or something close. Maybe that's just my ignorance when it comes to metallics. An Enemy: Never thought of it... I'm just learnging to expand my metals right now. BigWill: See, that sounds like too much work for me. I want simple and easy. I don't mind a little extra work, but getting into using specific paints or your model will dissolve is a bit out of my range. Izaak: Tin Bits as an undercoat to BGM? How does that work? geneguard: I do have just a couple of them. Really only the colors I thought looked cool to me. A particular blue and some light browns. Mordian7th: I thought I'd post it because it made such an impact on me as I brushed it onto my model. I just stood there and thought this is really nice. I find it interesting that you DON'T use Tin Bitz. For as long as I've used Boltgun, I've used Tin Bitz. That is because I always use Tin Bitz as a base over which Boltgun will go. I find building up the metallic colour in this way helps provide some depth to it. I do find it a bit odd of how you have not found a use for Tin Bitz. I almost have it on every model that has something metallic on it! (Even a Fire Prism is base coated with it) It's mostly a base for other, lighter metals on it. But I would agree, I love BGM for a color. 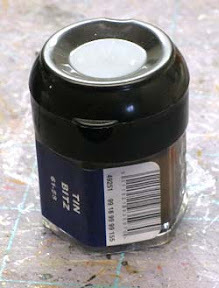 It is similar to Tin Bitz as a base drybrush or basecoat to build on. With a couple of washes, it gives real depth to a model and highlighted with Mithril Silver, looks great every time for armor. @Devlanmud: I will have to try the wash of Hawk Turquoise! Thanks for the tip! honestly, drybrushing boltgun metal over a black mini is what I used to get my friend into the hobby. It really does seem like a rite of passage you somehow skipped. Ok... I missed the whole boat on basecoating with Tin Bitz and then going over it with Boltgun Metal. I don't get out much obviously. Next time I get a chance, I show you guys my results when I do it on a model. BGM also dry brushes really nicely. Reaper Master Series metallics. Done. The pigments are great, the flow is wonderful (and can be thinned a bit before losing consistency), and the metal flakes are nice and fine. Warm "grey/white" metals, got a triad for that. Cool "grey/white" metals, got a triad for that. Bright golds, triad for that. Older golds, triad for that as well. Colored metallics? Yep, they've got them too (but not in triads of shade, midtone, and highlight). yes, even metallic black (Adamantium Black, iirc). Emerald Green works amazingly well as a base for green silks. So many painters swear by these, and I've known some long time GW users who tried them and switched. In fact, one of them has 26 demons, a Slayer Sword, and paints professionally on commission, as well as doing studio work for Wyrd and Grindhouse. VMA metallics are great for silvers, but RMS metallics do it all. Once I made the switch, I couldn't go back to anything else. Shadowed Steel, Honed Steel, and Polished Steel makes for a great looking metal with just a hint of blue. Add in washes and glazes to taste for the shadows, and you're set. People like Tin Bitz for that dirty look, but if you really want a nice base for darker, dirtier metals, RMS Scorched Metal will make you smile. Ron, I too am a big fan of the GW Boltgun Metal! I've also worked with the Vallejo equivalent and, as other's have mentioned, it's not quite as nice IMO as the GW metallic. Since I'm so in love with the Vallejo squeeze bottles, for select colors that I prefer in GW's line, I've been buying empty Vallejo-type dropper bottles and dumping as much of the GW paint into them as I can. I certainly waste some paint in the process, but it's worth it for the dropper to me. For metal on most rank and file troops, I usually end up doing boltgun metal followed by a badab black wash and call it a day. I use a mix of everything, but for silver colored metals I've moved almost exclusively to the P3 range (with Vallejo Air for extreme highlights). P3 uses liquid pigments which means no "glitter" effect on metallics. Their Pig Iron is almost a dead ringer for Bolt Gun Metal in appearance, but it's even smoother. The Vallejo Air paints are so shiny because the pigment they use is about 10x smaller than what's in GW paint. Both ranges are excellent choices for metals. I love the rich colour you get with BGM. It's dark enough that it works on everything, but not so dark that you need to highlight it to look good. And what other people have said about the smoothness is true as well. For the metal bits on my Templars, which is the usual concertina sections on the back on knees and elbows plus the chest emblem and all of the weapons, I have used three colours and a wash. It looks good and is simple, without adding colours that take away from the 90+% black I am using on the armour. I also change sizes of brush when doing that, which helps with accuracy for me. I will be looking into those Reaper MS metallics, they sound delicious! Ron, have you painted any Warmachine/Hordes models? I use Tin Bitz as a base for a darker more brooding gold on my Dark Angels and Deathwing. I'm going to have to try the Tin Bitz as a base for my gold areas. I usually go with a darker color brown as the base for gold. Marshal: Funny you should ask that very question... in the coming weeks I have a WM model that I am doing for a charity project. More to come on that one later on though since I'm tidying up some last things on a few projects this week.